3 Research conducted in partial fulfillment of requirements for the MS degree. Abstract: Studies were conducted to determine if corn stalk strength had an effect on southwestern corn borer (Diatraea grandiosella Dyar) survival during different growth stages. In 2006 southwestern corn borer larvae were placed on corn plants during dough stage near the ear and base of the plant. Penetration resistance was lower and borer survival was higher near the ear than near the base of the plant. In 2007, five corn hybrids were planted at three locations in Mississippi. Plants were infested with five 3rd instars at the ear zone during tassel, dough, and dent stages. Survival decreased as the corn progressed from tassel to dent stage. Survival varied among corn hybrids. The relationship between stalk strength and borer survival was not consistent, indicating that there are likely factors more directly limiting borer survival than physical stalk strength. Since the southwestern corn borer, Diatraea grandiosella (Lepidoptera: Crambidae), was first introduced in the United States, it has been a serious and destructive pest of corn (Chippendale and Sorenson 1997). The southwestern corn borer is also considered a pest on several other hosts (Davis 1965), namely sorghum, sugarcane, broomcorn, sudangrass and johnsongrass (Metcalf and Metcalf 1993). The southwestern corn borer causes crop losses in the southern corn-producing states ranging in the millions of dollars annually (Chippendale and Sorenson 1997). The land area planted to corn and the value of corn has increased in the southern corn producing states during the last several years (USDA NASS 2009), increasing potential damage losses. Southwestern corn borer larvae damage corn in three major ways (Henderson and Davis 1969, Moulton et al. 1992). First-generation larvae feed on leaf material before moving down into the growing point of whorl stage corn plants. This feeding causes a condition known as “dead-heart,” in which the growing point of the plant dies and can result in yield loss due to reduced plant population (Henderson and Davis 1969, Moulton et al. 1992). The second type of damage is stalk feeding, which is generally caused by second-generation larvae tunneling into the corn stalk (Moulton et al. 1992). This generation generally coincides with corn in the late vegetative or early reproductive stages, which are very important periods of plant growth and development with high requirements for nutrients and water (Ritchie et al. 1997). Feeding during this period therefore reduces yield because it interrupts the translocation of plant nutrients and water to the developing ears. Third-generation larvae feed during the late reproductive stages and cause stalk lodging (Henderson and Davis 1969). The larva enters the corn stalk in a manner similar to the second generation, and tunnels to the base of the stalk where it girdles a groove inside the stalk, weakening the base of the plant, resulting in the stalk falling under its own weight or from high winds. Corn yield losses due to third-generation girdling are attributed to the inability to harvest ears from fallen plants and increased losses from bacterial and fungal diseases (Henderson and Davis 1969). Control of the southwestern corn borer can be achieved by using many different methods. Mortality of overwintering larvae can be caused by cold weather, excessive moisture, lack of moisture, rotting of the stubble, termites, and disease (Davis et al. 1933). During the growing season, rain may dislodge eggs, and water standing in the whorl of the plant can cause death of early instars located inside. Early instars of later generations are affected by the tough fibrous tissue of the corn leaves and some subsequently die of starvation (Davis et al. 1933). When these natural controls are inadequate, in-season control of the insect can also be achieved by timely insecticide applications (MSU Extension 2007). However, application timing is critical because effective control is difficult once the larva has penetrated the stalk. Control of early instars can reach 80% (MSU Extension 2007), but larvae can emerge over several weeks (Chippendale 1982), so multiple insecticide applications might be required for sufficient control. The use of genetically modified crops is another effective means of control. Toxins from Bacillus thuringiensis (Bt) are currently used for control in genetically modified plants. Southwestern corn borers cause limited damage to transgenic corn hybrids compared with their non-Bt counterparts (Allen 2002). In addition to low larval survival, larvae that survive on Bt corn weighed significantly less than larvae on non-transgenic hybrids (Williams et al. 1997). While Bt corn is currently a highly effective method of controlling southwestern corn borer, 20–50% of corn acres cannot currently be planted to Bt-corn in cotton production areas due to resistance management concerns (Monsanto 2009). Therefore, alternative methods of control are needed. Several studies have measured corn stalk strength and examined its relationship to plant lodging. Berzonsky and Hawk (1986) found that as stalk strength increased, lodging decreased. Stalk strength can be indirectly measured by counting lodged stalks over several locations. However, the variability of environmental conditions such as wind gusts, soil moisture, different plant genotypes, etc. makes this a poor method of measuring lodging resistance in corn (Sibale et al. 1992). Some direct methods of measuring stalk strength include bending, crushing, penetration, shearing, and measurements of rind thickness (Zuber and Grogan 1961, Schertz et al. 1978). A rind penetrometer is useful in evaluating stalk strength for lodging resistance (Sibale et al. 1992, Kang et al. 1999, Jampatong et al. 2000, Flint-Garcia et al. 2003). However, most studies have focused on breeding for overall lodging resistance and the impact of certain bacterial and fungal infections, and did not evaluate insect damage. One exception is a study that compared rind penetrometer resistance and the ability of European corn borer larvae to feed in corn (Martin et al. 2004). In this study, breeding lines had no significant differences in penetrometer resistance or in first generation European corn borer damage or lodging during the vegetative stage. However, there were differences among lines in damage from second-generation European corn borer and penetrometer resistance during reproductive stages. 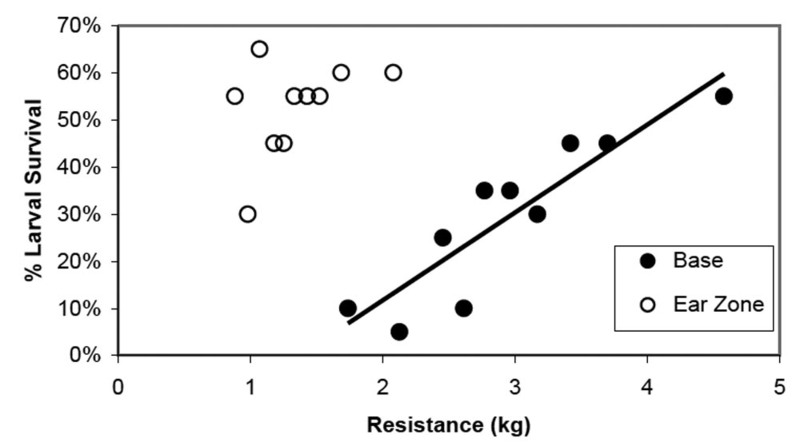 There was a negative correlation between feeding damage and stalk strength and a positive correlation between penetrometer resistance and the amount of certain lignins and fibers in the stalk. Therefore it was hypothesized that lignins and fibers might provide both physical and chemical resistance as these constituents increase stalk strength and reduce the digestibility of the stalk for European corn borer. The current study evaluates the relationship between the penetration resistance of corn stalks and the ability of southwestern corn borer larvae to penetrate the stalk. Several practical applications from this research could prove beneficial to southwestern corn borer management. Breeders could use a rind penetrometer to identify or breed for increased corn stalk strength to reduce southwestern corn borer feeding. Resistant hybrids could be grown to reduce the need for insecticides on non-transgenic crops and to reduce selection pressure in transgenic crops. Another application of this experiment could be to determine a stalk strength and/or growth stage at which southwestern corn borers cannot penetrate, which would allow producers to avoid insecticide applications when the corn is not vulnerable to southwestern corn borer. Penetrometer Measurements. A digital force gauge (Model DFG51, Omega Technologies Company, Stamford, CT) was used to record the force necessary to penetrate a corn stalk in 0.02-kg increments. It was a hand-held gauge attached to a pointed steel probe affixed to a threaded bolt on top of the housing. A pointed probe with 0.24-cm diameter was used based on preliminary testing indicating that this probe provided consistent measurements, while larger probes tended to split the stalk fibers and gave inconsistent readings. An acrylic plate was screwed onto the back of the force gauge to function as a stop bar as used by Sibale et al. (1992). The stop bar was set to allow the probe to penetrate 1 cm into the stalk. To take rind penetration measurements, the stalk was held firmly and the probe was quickly thrust perpendicular into the stalk until the stop bar touched the stalk. The highest force exerted during penetration was displayed on the meter and recorded. All measurements were made with the same pointed probe, and our experience showed that there was not a clear relationship between probe diameter and penetration resistance, so the force required to penetrate the stalk is expressed in kg rather than kg/cm2. Southwestern Corn Borer Rearing. Southwestern corn borer eggs from the USDA rearing lab in Starkville, MS were received as needed on wax paper sheets. The eggs were kept in a rearing room maintained at 16:8 light: dark, 27 °C and 60% relative humidity. Upon hatching, the egg sheets were divided equally and placed into plastic containers measuring 25.5 cm wide, 39 cm long, and 13 cm deep. Approximately 240 ml of sterilized 2% water agar solution was put in each container in order to maintain a moist environment. A moist paper towel was placed on top of the agar followed by 4–5 fresh corn leaves and a sheet of eggs. Additional layers of paper towels, leaves, and egg sheets were added until they reached the top of the container. A hole was cut into the lid and covered with cheesecloth to allow air circulation. The upper leaves were replaced every 2–3 days. The larvae fed 5–6 days until they reached third instar, at which time they were placed on corn plants. Third instars were chosen for infestations because no stalk tunneling occurs before the third instar (Whitworth et al. 1984). 2006 Trial. A single non-Bt corn hybrid, Terral 2440 (Terral Seed Inc., Lake Providence, LA), was chosen for this trial to determine how much variation in stalk strength existed between plants. Corn was planted on 97-cm rows at the Brown Loam Experiment Station in Raymond, MS on 23 March 2006 and standard agronomic practices were maintained throughout the growing season. When the corn reached the dough stage (R4) (Ritchie et al. 1997), 200 randomly selected plants were evaluated for southwestern corn borer penetration and stalk strength. Five third instar borers were placed directly onto the leaf sheath just below the primary ear and below the second internode above the ground using a fine paint brush. Survival, measured as penetration through the stalk rind into the interior pith, was evaluated after three days. Penetration was determined by peeling back the leaf sheath on which the larvae were placed and examining the stalk for holes. At the time of penetration evaluation, the same internodes immediately above the ear and between the lowest two nodes of the plant were probed with the rind penetrometer. To evaluate the relationship between penetrometer resistance and southwestern corn borer survival, individual plant data were ranked according to penetrometer resistance. Twenty consecutive plants in the ranked data were then grouped together to estimate southwestern corn borer survival as a function of penetrometer resistance. This was done independently with ear and base locations as well as with combined data for both plant locations. Grouped data were analyzed as a correlation between penetration resistance and southwestern corn borer survival using PROC CORR (SAS Institute 1999). 2007 Trial. Corn was planted at two locations within the R. R. Foil Plant Research Center in Starkville, MS on 9 April (North Farm 1) and 30 April 2007 (North Farm 2), and at the Brown Loam Experiment Station in Raymond, MS on 23 April 2007 in a randomized complete block design with four replications at each location. Each plot was four rows wide, 15.2 m long with a 2 m gap between replicates and a four-row planted border around the entire plot. Corn was planted on 97-cm rows and standard agronomic practices were maintained throughout the growing season. Five non-Bt corn hybrids were chosen for their range in stalk strength based on seed company reports of stalk strength or stalk standability. Ratings of strength or standability were either on a scale from 1 to 10, with 10 being the strongest or on a scale from poor to excellent. The five corn hybrids tested (strength ratings and seed company in parentheses) were: 23R31 (10; Terral Seed Inc., Lake Providence, LA), 25R31 (9, Terral Seed Inc.), P33-10 (average, Pioneer Hi-Bred International Inc, Johnston, IA), 32R25 (poor, Pioneer Hi-Bred International Inc.), and 668 (excellent, Dekalb, part of Monsanto Company, St. Louis, MO). All these hybrids were approximately the same maturity (113–116 days relative maturity) so that they would reach each growth stage at approximately the same time. Stalk strength is generally associated with plant growth stage (Ritchie et al. 1997), so the ability of southwestern corn borer to penetrate corn stalks and stalk strength were evaluated at VT-R1 (tassel), R4 (dough), and R5 (dent) growth stages. During each growth stage, 20 consecutive plants were infested with five third instars at the leaf immediately above the ear leaf in each corn hybrid. After five days the stalks were examined to determine if the larvae were able to penetrate through the rind and enter the pith. At this time the force required to penetrate through the rind in the internode above the ear was also determined by using the penetrometer for each infested plant. Probing was done in a region that showed no damage from southwestern corn borer feeding. Data from all locations were initially analyzed together, but many interactions with location made interpretation difficult. Therefore data for each location were analyzed independently. Experimental units were twenty consecutive corn stalks and the sampling unit was a single plant in each plot. Differences in mean force required to penetrate the stalk and southwestern corn borer survival were compared for growth stages, hybrids and locations by using PROC GLM. Differences were considered significant for a = 0.05. 2006 Trial. Comparison of the mean upper and lower force measurements showed that the lower portion of the stalk required more force to penetrate than the upper portion of the stalk (Figure 1). Larval survival was 53% and 30% on the upper and lower portions of the stalk, respectively (Figure 1). These results were consistent with expectations that larval survival would be lower where stalk strength was greatest. A closer examination of the data explored the relationship between penetration resistance and southwestern corn borer survival within each corn stalk location. Contrary to expectations based on mean larval survival at the base and ear zone, southwestern corn borer survival increased 18.6 ± 3.2% for every kg increase in penetration resistance at the base of the stalk (r = 0.901; P < 0.001) (Figure 2). There was no relationship between penetration resistance and southwestern corn borer survival in the ear zone (r = 0.438; P = 0.205), nor when both stalk locations were combined (r = –0.167; P = 0.481). Based on this analysis, stalk strength does not appear to be a limiting factor of southwestern corn borer survival within the range tested. Rather, stronger stalks, at least at the plant base, contained some trait or traits that increased survival. This may have been due to higher moisture content or more nutritious tissue as the stronger stalks tended to be the larger plants that were not quite as mature (personal observation). The major conclusion drawn from these data is that stalk strength within one commercial hybrid is not a limiting factor for southwestern corn borer survival, although it may be associated with plant characteristics that could impact southwestern corn borer survival. Figure 1. Mean stalk penetration resistance and southwestern corn borer (SWCB) survival (± SEM) on corn during dough stage. Raymond, MS during 2006. Figure 2. Southwestern corn borer larval survival after five days when placed in the ear zone or at the base of the plant. Each point is the mean of 20 plants after being ranked by stalk resistance. Line is the base data correlation. Data collected from Terral 2440 hybrid corn during dough stage in Raymond, MS during 2006. 2007 Trial. Stalk penetration resistance was analyzed by using the effects of location, growth stage, hybrid, and their interactions. The three locations and most two and three-way interactions with location were significant when all locations were analyzed together (data not shown). Because penetration resistance was not impacted similarly at each location, the three locations were analyzed independently for penetration resistance. At the Brown Loam site, growth stage, hybrid, and the interaction, all significantly affected penetration resistance (Table 1). Penetration resistance was greatest during the tassel stage and least during the dough stage (Figure 3). The hybrids at the Brown Loam site expressing the greatest resistance overall were 668 and 23R31. The interaction of growth stage and hybrid was significant, largely due to 668 and P33-10. At the tassel stage, P33-10 had the most resistance and 668 had the least resistance, but by the dough stage this was completely reversed. In the two North Farm locations, growth stage and hybrid significantly influenced penetration resistance as at the Brown Loam site. However, unlike the Brown Loam location, the interaction was not significant at either North Farm location (Table 1). At North Farm 1, average penetration resistance over all hybrids was greatest during the tassel and least during the dent stages (Figure 3). However, at North Farm 2, resistance was least during the dough stage and similar during the other stages. At both North Farm locations, hybrids 23R31 and 668 had the highest penetration resistance, and 32R25 and P33-10 had the lowest penetration resistance. Hybrid differences in stalk penetration resistance at all locations were consistent with the ratings provided by the companies, indicating that hybrid selection was effective in achieving a range of stalk strengths for testing our hypothesis that stalk strength can impact southwestern corn borer survival. Table 1. ANOVA by using type-3 sums of squares for penetration resistance at all locations in 2007. Figure 3. Least square mean penetration resistance (± SEM) of five corn hybrids during three growth stages at the Brown Loam, North Farm 1, and North Farm 2 locations during 2007. Resistance of hybrids with the same letter within a growth stage group at a location are not significantly different (α = 0.05). The factors of location, growth stage, and hybrid plus the factor of penetration resistance were evaluated for their impact on survival of southwestern corn borer larvae. Location was a significant factor with much lower survival at Brown Loam than at either North Farm location (Table 2). Several factors could have contributed to the lower survival at the Brown Loam site, including the longer transportation time of the larvae to the Brown Loam site (2 hr) compared to the North Farm (10 min), different weather conditions, and more highly drought-stressed corn since the Brown Loam site was not irrigated. Southwestern corn borer survival was <15% at the Brown Loam site during all infestation periods (Table 2), and there were no significant differences in survival among hybrids at this location (F = 0.25; df = 4, 47; P = 0.906), so the Brown Loam data were not included in the larval survival analysis. 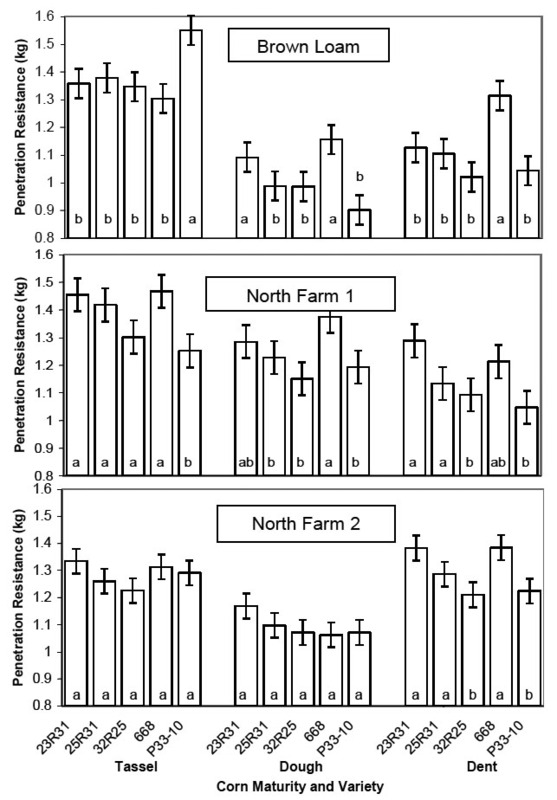 Larval survival data from the two North Farm locations were combined for analysis because there were no significant factors involving location after omitting the Brown Loam data. Table 2. Mean force (±SEM) required to penetrate the corn stalk and southwestern corn borer (SWCB) survival over all hybrids at three locations in MS during three growth stages during 2007. Southwestern corn borer survival was significantly impacted by corn growth stage, hybrid, penetration resistance, and interactions between these factors (Table 3). Survival was highest during the tassel stage (38.8 ± 2.6%) and lowest during the dent stage (7.3 ± 2.1%) (Figure 4). Survival was impacted by hybrid during the tassel and dough stages, but not during the dent stage. However, the hybrids with the lowest survival were not consistent between the tassel and dough stages. 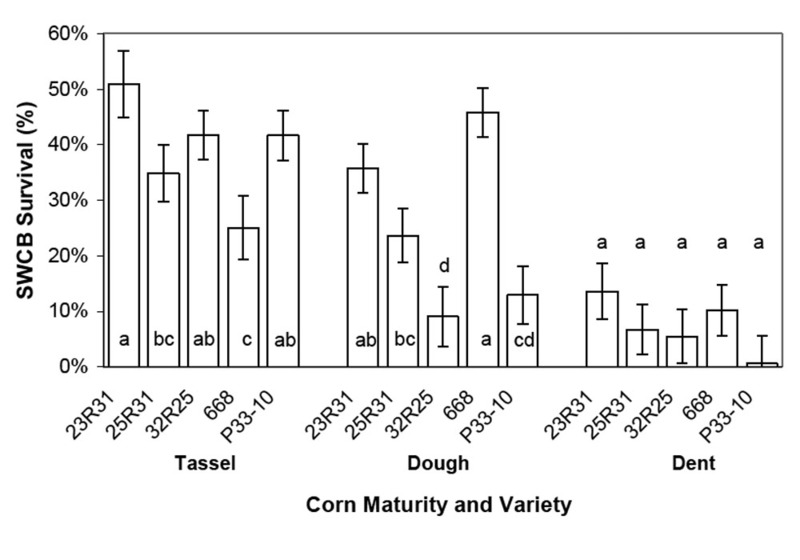 Larval survival in hybrid 668 was the lowest among the varieties during the tassel stage, but the highest during the dough stage (Figure 4). The reasons for these shifts are not clear, but they were not related to changes in penetration resistance because penetration resistance did not change in this manner (Figure 3). Table 3. Analysis of variance by using type-3 sums of squares for southwestern corn borer survival at both North Farm locations during 2007. Figure 4. Least-square mean southwestern corn borer (SWCB) survival (± SEM) on five corn hybrids during three growth stages at two North Farm locations during 2007. Hybrids with the same letter within a growth stage group do not have significantly different southwestern corn borer survival (α = 0.05). While penetration resistance was clearly not the only factor influencing southwestern corn borer survival, it was a significant factor, and interactions of penetration resistance with growth stage and hybrid were also significant (Table 3). The three-way interaction of penetration resistance with hybrid and growth stage was not significant (F = 1.51; df = 8, 87; P = 0.165). Therefore, the three-way interaction was deleted from the final model. During the dough and dent stages, an increase in penetration resistance corresponded to reduced survival (Table 4). However, penetration resistance had no impact on larval survival during the tassel stage. For 23R31 and P33-10 hybrids, an increase in penetration resistance resulted in reduced southwestern corn borer survival (Table 4). In contrast, penetration resistance was not a significant factor of mortality for any of the other hybrids tested. Table 4. Impact of penetration resistance (PR) on southwestern corn borer (SWCB) survival during different growth stages and in different varieties. North Farm locations during 2007. Summary. The initial hypothesis of this experiment was that as the corn stalk matured, stalk strength would increase and that stalk strength was related to southwestern corn borer survival. It was believed that as the stalks accumulated more lignins and fibers, the stalk would become harder and rigid, causing decreased survival of the southwestern corn borer. The survival of the southwestern corn borer was greatest during the tassel and lowest during the dent stages, as expected. However, the stalk was more difficult to penetrate during the tassel than during the dent stages at two of the three locations (Figure 3). At the tassel stage, the moisture content of the plant was high, making the cells swollen and turgid. As the plant aged, its cells lost moisture (Igathinathane et al. 2006), causing them to lose their turgidity and increasing the space between cells. This shrinking of cells could have allowed the probe to penetrate the stalks more easily at the dent stage. While there were significant relationships between penetration resistance and southwestern corn borer survival, they were highly variable, indicating that stalk strength might not be the key factor, but that it might be correlated with another more important factor in some situations. Plant chemistry is one plausible factor that could influence southwestern corn borer survival on different hybrids and at different growth stages. Grasses produce all of the essential nutrients that insects need for normal growth and development (Bernays and Barbehenn 1987). However, the availability of important nutrients might become limited as the plant ages. One limiting nutrient is nitrogen, which is strongly related to the approximate digestibility of plants to insects. Nitrogen often limits the growth of plants throughout the growing season, so as the corn plant matures and nitrogen levels steadily decline, it becomes increasingly difficult for the insects to obtain enough nitrogen from the plant tissue for normal growth and development. The lower water content of leaves and vegetation can also cause lower growth rates for caterpillars (Bernays and Barbehenn 1987). Physical factors also affect the growth and development of insects. As the plant ages, the lignification of plant tissue makes the plant increasingly harder to chew and to digest. This lignification deters the feeding of chewing insects, including the southwestern corn borer (Bernays and Barbehenn 1987). This research shows that penetration resistance impacts the survival of southwestern corn borers, so breeding for a stalk based on the force required to penetrate tissue might have some merit. Furthermore, previous research has shown a strong relationship between stalk strength and lodging resistance (Sibale et al. 1992, Kang et al. 1999, Jampatong et al. 2000, Flint-Garcia et al. 2003), so breeding for strong stalks should minimize the lodging damage caused by southwestern corn borers. However, the impact of stalk strength on southwestern corn borer survival was variable, so there is no assurance that stronger stalks will result in less physiological stress to corn. Based on the 2006 lower plant data, one would expect more tunneling on the strongest plants (Figure 2), but 2007 data showed decreased larval survival as penetration resistance increased when penetration resistance was a significant factor (Table 4). If breeding for stalk strength, selections should be for a hybrid that is strong during tassel since this was the period of greatest survival. One factor that should be considered is increased lignification at earlier stages, because a stalk that contains more lignins and fibers would be expected to be harder to penetrate by southwestern corn borer larvae. The penetrometer used in this experiment was a very useful tool in measuring stalk strength. One concern with the penetrometer, as well as with some other sampling methods (Musser et al. 2007), is operator-to-operator consistency. In this experiment, only one person handled and probed the plants, so this source of error was eliminated. However, during initial research with the penetrometer, the speed with which the operator pierced the stalk was found to alter the readings. Pressing the probe into the corn stalk very slowly resulted in more force required to penetrate. When the probe was thrust very quickly into the stalk, the readings were much lower and were very erratic. It took practice by the operator to insert the probe into each stalk in a manner that provided consistent measurements. Multiple operators might not use a consistent technique, and therefore the data generated will not be comparable. This could be eliminated by developing a mechanical press system. However, it would most likely make the machine large, heavy and cumbersome when transporting it from field to field. Since part of what makes the penetrometer desirable is its quickness, mobility, and efficiency, such a method may not be practical. Our research has demonstrated that penetration resistance is a factor in southwestern corn borer survival. However, it appears that other factors might be more critical in determining survival. The explanation for reduced southwestern corn borer survival in more mature corn needs to be further examined. Based on this study, the roles of location, physiological changes and related nutritional changes in stalk strength and southwestern corn borer survival are factors that may be good factors to manipulate in future studies. Clearer insights might also be gained by selecting more diverse genetic lines than the hybrids used in this experiment. Plant strength could be used as a form of host plant resistance in a variety of crops to deter insect feeding. Examples of other crops where physical resistance might modify damage could be cotton bolls with relation to Heliothine feeding, and sorghum stalks in relation to lepidopteran borers. Stink bugs and tarnished plant bugs feed by penetrating their needle-like mouthparts into stems and fruit, so a smaller probe might be appropriate to measure plant resistance to these piercing-sucking insects. Mechanical resistance to insect feeding might be a mechanism that could offer improved host plant resistance in many different crops that needs to be further explored. The authors acknowledge W. Paul Williams, Angus L. Catchot and Clarence H. Collison for their input in shaping this project. Donald Cook and Jeff Gore provided helpful criticism of earlier drafts of this manuscript. Assistance in field implementation was provided by Kathy Knighten and numerous summer workers and graduate students at Brown Loam and Starkville experiment stations. This article was approved for publication as journal article J-11646 of the Mississippi Agricultural and Forestry Experiment Station, Mississippi State University. Bradley Kyle Gibson, the first author of this paper, died in a car accident on March 22, 2009 near Carthage, MS at the age of 26. Brad was the son of Jerry and Fredna Gibson of Terry, MS. Brad received his B.Sc. in Agricultural Pest Management from Mississippi State University in 2005. He stayed at Mississippi State to work on his M.Sc. in Entomology under the direction of Don Parker and Fred Musser. He was planning to complete his thesis in May, 2009 and had received a job offer from Monsanto Company just two days before his death. Brad loved everything outdoors, and enthusiastically participated in a wide variety of outdoor activities ranging from baseball to hunting to collecting tarnished plant bugs. 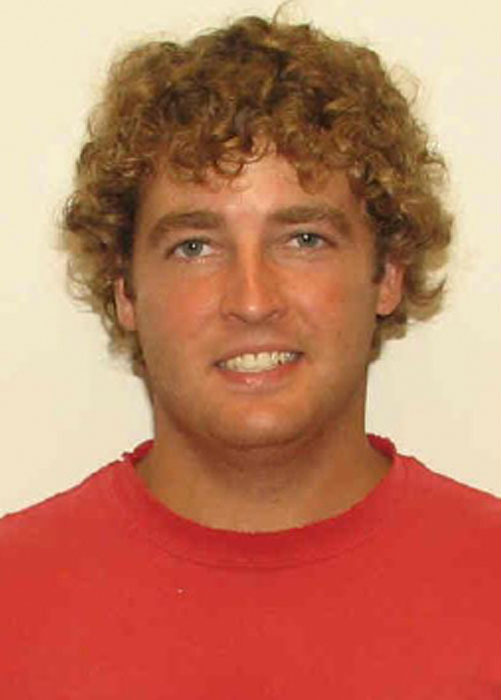 Within the Mississippi Entomological Association, Brad received second and third places in the annual meeting student speech competition in 2006 and 2007, respectively. He also won second place for his poster at the joint meeting of the MS Agricultural Pest Management Associations in 2008. In addition to his parents, Brad is survived by a brother, Scott, a grandmother, Mary Hudgins, and numerous extended family members. Allen, K. C. 2002. Influence of transgenic corn expressing the cry 1Ab endotoxin (event Mon810) on Helicoverpa zea (Lepidoptera: Noctuidae) and Diatraea grandiosella (Lepidoptera: Crambidae). M.S. thesis, Mississippi State University, Mississippi State, MS.
Bernays, E. A., and R. Barbehenn. 1987. Nutritional ecology of grass foliage-chewing insects, pp. 147-176. In F. Slansky, Jr. and J. G. Rodriguez [eds. ], Nutritional Ecology of Insects, Mites, Spiders and Related Invertebrates. John Wiley & Sons, New York. Berzonsky, W. A., and J. A. Hawk. 1986. Agronomic features of two maize synthetics selected for high and low stalk-crushing strength. Crop Sci. 26: 871-875. Chippendale, G. M. 1982. Insect diapause, the seasonal synchronization of life cycles, and management strategies. Entomol. Exp. Appl. 31: 24-35. Chippendale, G. M., and C. E. Sorenson. 1997. Biology and management of the southwestern corn borer. In Radcliffe's IPM World Textbook, http://ipmworld.umn.edu/chapters/chippen.htm. Davis, E. G., J. R. Horton, C. H. Gable, E. V. Walter, and R. A. Blanchard. 1933. The southwestern corn borer. Technical Bulletin 388, United States Department of Agriculture. Washington, D. C.
Davis, F. M. 1965. Biology of the southwestern corn borer, Zeadiatraea grandiosella (Dyar) in Mississippi. M.S. thesis, Mississippi State University, State College, MS.
Flint-Garcia, S. A., M. D. McMullen, and L. L. Darrah. 2003. Genetic relationship of stalk strength and ear height in maize. Crop Sci. 43: 23-31. Henderson, C. A., and F. M. Davis. 1969. The southwestern corn borer and its control. Bulletin 773, Mississippi State University Agricultural Experiment Station. State College, MS.
Igathinathane, C., A. R. Womac, S. Sokhansanj, and L. O. Pordesimo. 2006. Mass and moisture distribution in aboveground components of standing corn plants. Transactions of the ASABE 49: 97-106. Jampatong, S., L. L. Darrah, G. F. Krause, and B. D. Barry. 2000. Effect of one- and two-eared selection on stalk strength and other characters in maize. Crop Sci. 40: 605-611. Kang, M. S., A. K. Din, Y. D. Zhang, and R. Magari. 1999. Combining ability for rind puncture resistance in maize. Crop Sci. 39: 368-371. Martin, S. A., L. L. Darrah, and B. E. Hibbard. 2004. Divergent selection for rind penetrometer resistance and its effects on European corn borer damage and stalk traits in corn. Crop Sci. 44: 711-717. Metcalf, R. L., and R. A. Metcalf. 1993. Destructive and Useful Insects: Their Habits and Control. Fifth Edition. McGraw-Hill, Inc., New York. Monsanto. 2009. 2009 IRM Guide, www.monsanto.com/monsanto/ag_products/pdf/stewardship/2009_irm_guide.pdf Accessed 5-7-2009. Moulton, M. E., R. A. Higgins, S. M. Welch, and F. L. Poston. 1992. Mortality of second generation immatures of the southwestern corn borer (Lepidoptera: Pyralidae). J. Econ. Entomol. 85: 963-966. MSU Extension. 2007. Should I be worried about corn borers? Mississippi State University, http://msucares.com/crops/corn/corn4.html. Musser, F., J. Robbins, D. Cook, G. Studebaker, J. Greene, E. Burris, R. Bagwell, S. Stewart, A. Catchot, and G. Lorenz. 2007. Comparison of direct and indirect sampling methods for tarnished plant bug (Hemiptera: Miridae) in flowering cotton. J. Econ. Entomol. 100: 1916-1923. Ritchie, S. W., J. J. Hanway, and G. O. Benson. 1997. How a corn plant develops. Special Report No. 48, Iowa State University of Science and Technology Cooperative Extension Service. Ames, IA. SAS Institute. 1999. SAS for Windows, Version 9.1. SAS Institute, Inc., Cary, NC, USA. Schertz, K. F., F. A. Al-Tayar, and D. T. Rosenow. 1978. Comparison of methods for evaluating strength of sorghum. Crop Sci. 18: 453-456. Sibale, E. M., L. L. Darrah, and M. S. Zuber. 1992. Comparison of two rind penetrometers for measurement of stalk strength in maize. Maydica 37: 111-114. USDA NASS. 2009. NASS Data and Statistics. United States Department of Agriculture National Agricultural Statistics Service, http://www.nass.usda.gov/Data_and_Statistics/Quick_Stats/index.asp. Accessed April 8, 2009. Whitworth, R. J., F. L. Poston, S. M. Welch, and D. Calvin. 1984. Quantification of southwestern corn borer feeding and its impact on corn yield. Southwest. Entomol. 9: 308-318. Williams, W. P., J. B. Sagers, J. A. Hanten, F. M. Davis, and P. M. Buckley. 1997. Transgenic corn evaluated for resistance to fall armyworm and southwestern corn borer. Crop Sci. 37: 957-962. Zuber, M. S., and C. O. Grogan. 1961. A new technique for measuring stalk strength in corn. Crop Sci. 1: 378-380.